These mini quiches will look very nice on the table. For dinner, part of a buffet or a lunch. And almost everyone loves quiche by the combination of dough and a tasty filling. It’s almost Easter and weekend, so probably you’ll get friends or family coming over for brunch, lunch or diner this weekend. Perhaps you’re wondering what to cook or prepare. 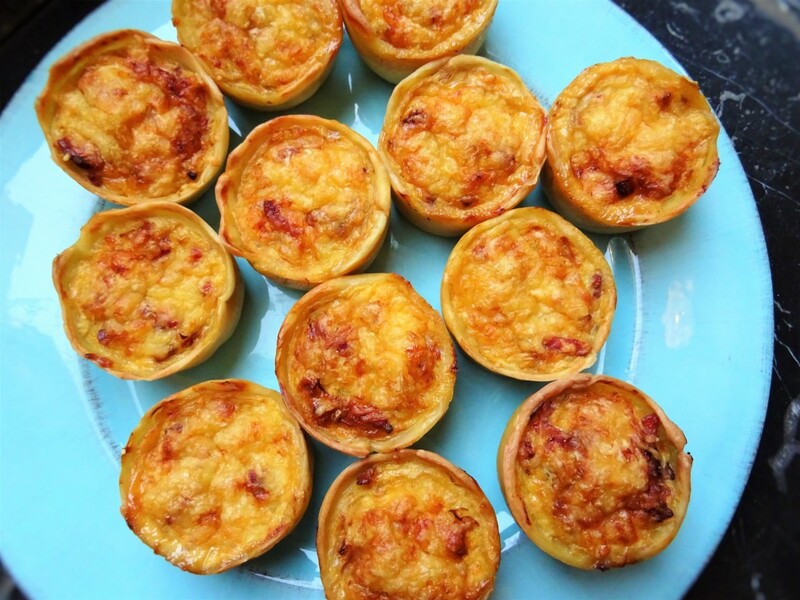 Well, than you should definitely make these mini quiches! Easy to create and almost everyone loves the ingredients that are in a quiche lorraine. If you make mini quiches as a snack before diner, then there will be plenty of room left in your stomach for the rest of the food 😉 Fortunately this quiches are not very filling, because we used low-fat quark. If you want to vary, you can also add some mixed nuts to the mixture and/or dried tomatoes. Heat a frying pan over high heat and add the bacon. Add the onion and stir. Lower the heat and fry for a few minutes until the bacon is crispy. Place some paper towels on a plate and spoon the fried bacon with onion on the paper towels. The paper will absorb the fat. Meanwhile, fry the leek in the pan and fry for a few minutes. Add the bacon/onion mixture and simmer on low heat until the leek is soft. Remove the pan from the heat and let the mixture cool slightly. Add the 3 egg yolks into a mixing bowl and add the cream, quark and 3/4 of the grated cheese. Spoon the leek/bacon mixture in the mixing bowl and stir together well. Grease the muffin molds and line the bottom (and sides) with defrosted puff pastry savory pie. Spoon the mixture into the cups. Bake the mini quiches in about 20-30 minutes. It depends on your oven. Remove the mini quiches from the oven, check if they are ready by checking them with a skewer. If the stick comes out clean they are done. If not, back in the oven! Remove the quiches from the muffin molds and serve on a beautiful dish!